Robert Hillary King speaks, Aug. 8. 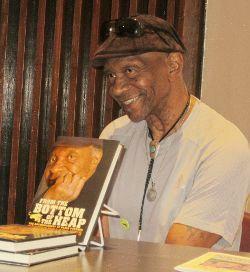 New York – For the many veterans of the human rights struggles, past and present, who were in the room, it was more than a book signing acknowledging the paperback publication of Robert Hillary King’s autobiography, “From the Bottom of the Heap.” It was a tribute to the Angola 3. King and Albert Woodfox are the two surviving members of the Angola 3, who, as members of the Black Panther Party for Self Defense inside the notorious prison compound at Angola, La., fought to improve living conditions in this massive torture chamber starting in the early 1970s. The three spent from 29 to nearly 44 years in prison in solitary confinement, which meant, to put it bluntly, decades of being tortured. The third member, Herman Wallace, had been released in October 2013. This was an act of supreme cynicism by the prison authorities, as Wallace died of liver cancer only three days after leaving prison. Albert Woodfox was released on his birthday in February, after having spent more than 43 years in solitary ­confinement. Robert King won release in 2001, never forgetting his brothers that were left behind. 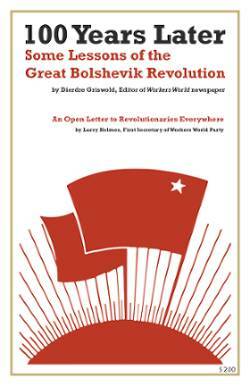 This book signing event was held at the union headquarters of SEIU 1199 in midtown Manhattan during the evening of Aug. 8. The audience was made up mainly of supporters, who applauded the frequent acknowledgements of Woodfox and King during the ceremony for their heroic endurance. Speakers also did a shout out to slain Panther George Jackson and noted the significance of “Black August,” associated with the struggle for and repression of Black Liberation fighters who were ­prisoners. Attendees were treated to a cultural presentation from a former partner in the duo Serious Bizness, before guest speakers shared their observations about the current state of affairs regarding the ongoing fight to free our political prisoners, along with overall conditions inside the United States. Speakers, besides King and Woodfox, included Anne Lamb of the Jericho Movement; Russell Shoatz III, the son of political prisoner Russell Maroon Shoatz; and Ramona Africa of the MOVE 9, among others. Common themes raised by the speakers included continued support for political prisoners, the need to honor their efforts and the never-ending need to fight for their release. Ho Chi Minh would be proud of the example set by these three heroic men.